This winter I am taking the second half of a two part ornithology course. The course work is focused on taxonomy and identification, and as such I spend a lot of time in a lab handling specimens, both mounted and study skins. The average birder will tell you that one of the many reasons for the hobby is that birds are beautiful, a fact that I am sure is known to most people. However, birds in the wild are not always sitting still in perfect lighting, so it can be a challenge to fully appreciate their feathers. Thus I thought I would share in an abstract kind of way how handsome and varied the plumage of birds found in eastern North America can be, using the study birds from the lab. Preferably I would have taken these pictures with a real camera (I used my cellphone), tripod, and better lighting, but I think the beauty of the feathers still shines through. 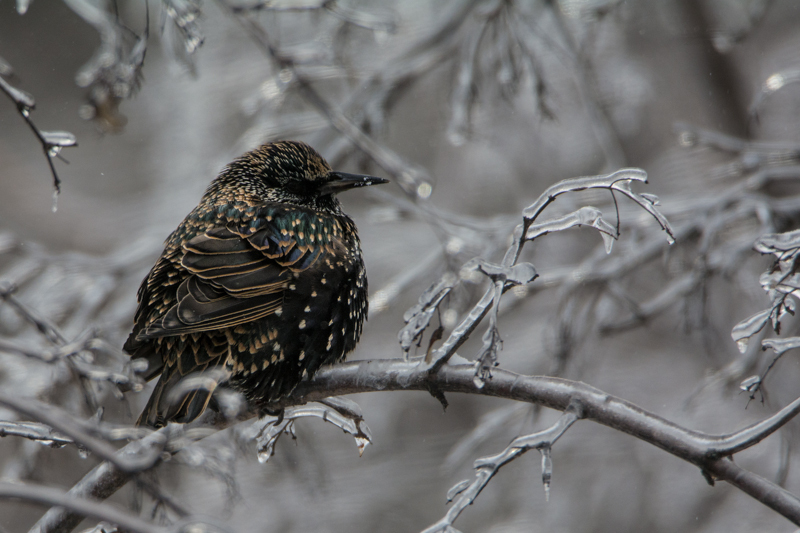 One of the most subtly beautiful winter birds in eastern North America is the European Starling. After breeding season, the Starling goes through its once yearly moult into its spotted basic plumage. Melanin pigment in feathers provides strength to the feather structure. The white spots of the European Starling, found at the tips of the body feathers, have relatively little melanin, hence their light colour. As the winter rolls on into spring these white tips will start to wear away due to their lack of strength (The wearing of light coloured winter plumage to reveal dark breeding plumage can be seen in other local birds, such as the House Sparrow and Snow Bunting). Come summer breeding season, the European Starling will be sporting a glossy, dark look that lacks the spots of winter. So while it’s still cold, get outside, look for a Starling, and take advantage of this beautiful winter plumage phenomenon. If you wait till it’s warm, it may be too late! On New Year’s Day morning, I joined 30 or so brave birders for Nature London’s annual New Year’s Day Walk in Springbank Park. It was a frigid, overcast, blustery day, but that was not a great enough deterrent for this plucky group of naturalists. However, it seemed like the birds did not share our enthusiasm for the cold wind. 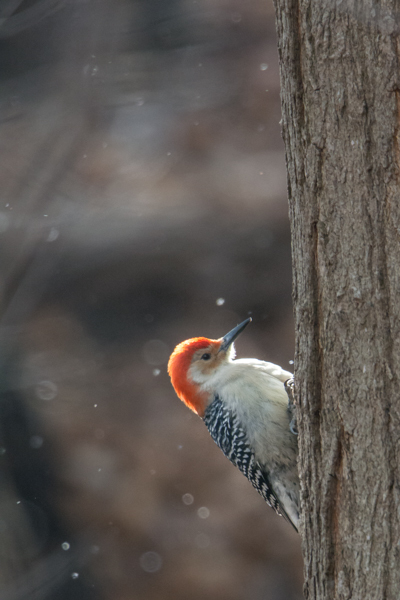 Male Red-bellied Woodpecker. Springbank Park, London. The highlight of the trip was a stunning male Red-bellied Woodpecker who managed to pose for just seconds during the only sunshine of the morning. I consider these birds a treat when I visit London because they are not common visitors to Ottawa. A second great find was a sleepy Green-winged Teal tucked in behind a large flock of Mallards. Non-bird highlights included a visible, intact Baltimore Oriole nest, a feat of engineering, and two beautiful Sycamore trees, indicator species of Carolinian Forest habitat. Overall, the group found 16 species of birds and approximately 150 individuals. Not too shabby for a not optimal weather day and a great start to 2015 birding. My partner dutifully scanning the Thames River for any ducks. I was lucky to also have my mother along for the morning. The sleepy Green-winged Teal behind a male Mallard. A Mallard-American Black Duck hybrid.